Brian Tanner unintentionally lost 20 pounds in the last year, was hit with two bouts of pneumonia in the last three months and spent 14 days under quarantine in the hospital. Much of the 52-year-old’s ails can be attributed to his homelessness. Until a few days ago, Tanner, of Levittown, had been living for three years in a tent in the woods with other homeless people. A former cross country truck driver, Tanner, who has mental and physical disabilities and suffered a nervous breakdown several years ago, was on a downward spiral until staff from the Center for Independent Living of Bucks County, as well as the Host Program Mental Health Association of Southeastern Pennsylvania stepped in to advocate for him. Both organizations fought for the last few years to help Tanner qualify for disability income, social security, apply for Section 8 housing (a 18-24 month process) and to support him through an ongoing custody battle. “Trying to navigate any of these programs without any assistance is a losing battle,” said Karen Hewlett, Independent Living Specialist and Program Manager for Bristol-based Center for Independent Living of Bucks County. Center for Independent Living of Bucks County Executive Director Josh Pittinger had a chance meeting with Tanner while at State Rep. Tina Davis’ office a year and a half ago. Pittinger overheard Tanner sharing that he had a disability and knew that his organization could help. Tanner has moved into an apartment as part of Bucks County’s Homelessness Prevention and Rapid Re-Housing Program. Hewlett said his rent will be covered under that program for six to nine months. The hope is that Section 8 housing will kick in before then. If not, 70 percent of his disability check would need to be used to cover rent, she said. Allen Johnson of the Host Program Mental Health Association of Southeastern Pennsylvania said his organization has helped 18 homeless individuals and families find housing since the organization began in December 2015. With Bucks County’s lone shelter having wait lists of 12 weeks or more, finding permanent housing can be a long process. “I kept his name and his face alive,” Johnson said of Tanner. Beyond securing an apartment, Tanner called on Johnson for support before and after stressful court proceedings and now for help furnishing his 800-square-foot apartment. 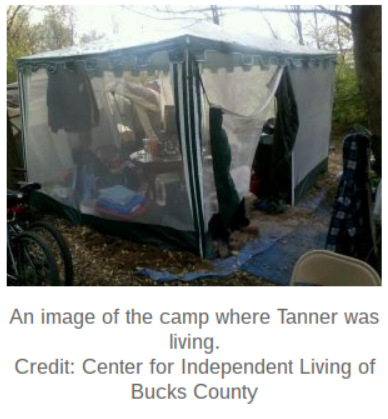 While living in his tent, Tanner washed his clothes at the Center for Independent Living office and spent time there to get out of the elements, particularly on extremely cold days. Now that his housing has been taken care of, Hewlett said she plans to work with Tanner on establishing a budget for his expenses. The Center for Independent Living of Bucks County is accepting clothing and home furnishing donations for Brian Tanner. Pots and pans and other cooking items are needed, as well as size large shirts, size 30-32 pants and size 10.5 to 11 shoes.